A common question at Beachside Physiotherapy is whether heat or ice should be applied to an injury. This is important as applying the wrong temperature can delay healing or even worsen the pain and swelling. The general rule of thumb is that ice suits acute injuries and heat benefits chronic conditions. And we often say that if its spinal pain we apply heat and if in the legs or arms we apply ice. I believe applying ice to the spine when in pain is quite uncomfortable and a little threatening to our system, therefore I go for heat to relax the tissues in question. An acute injury is one that happens suddenly and causes instant pain, swelling or bruising. You may have sprained or fractured your ankle playing soccer or shut your fingers in the car door. •Put a moist towel or barrier between the ice pack and the skin to avoid an ice burn. •Leave the ice pack on for 10-15 minutes, ideally every 2-3 hours until the injury really starts to improve. Check your skin while the ice pack is on – it should be pink. If your skin has gone white, this may signify an ice burn. •Don’t use an ice pack if you have areas of loss of skin sensation. •Remember RICE (Rest the injured body part, apply an Ice pack and light pressure wrap Compression, Elevate the body part). Ice decreases pain by raising our pain threshold, overriding pain sensations and releasing natural neurochemicals like endorphins. Ice also reduces swelling by cooling the skin’s surface and its underlying tissues, which narrows blood vessels allowing less blood to reach the area. Every few minutes the blood vessels re-open and blood returns. This process repeats in cycles. 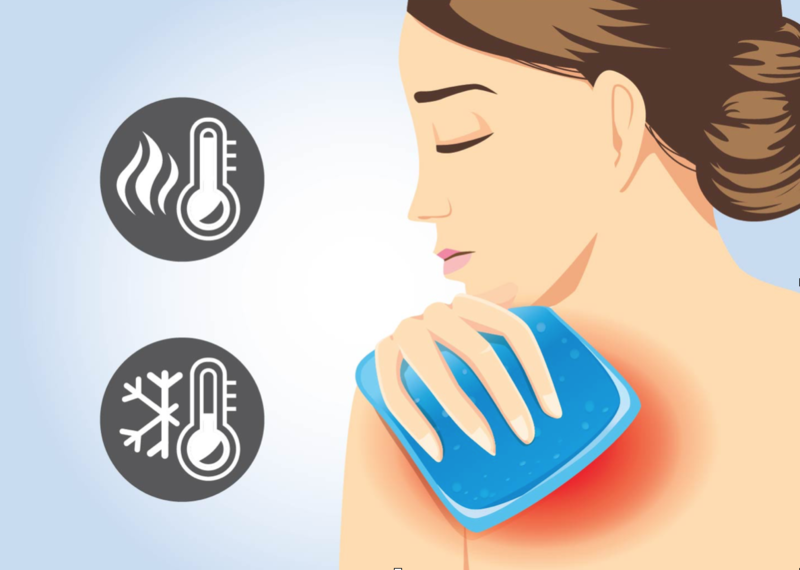 If you have joint inflammation from arthritis you should use ice, although if you have morning stiffness, try heat in the morning and ice later if your joints become inflamed and painful. •The temperature should be warm not hot. •Put a towel between the skin and the heat source. •Don’t use heat where there is swelling. Use ice first. •Don’t use heat if you have poor circulation or diabetes. •Don’t use heat over an area where with reduced sensation. •Never lie down on a heat source. •Don’t use heat on an open wound or stitches. Heat increases the skin’s temperature and underlying tissues to open blood vessels and allow more blood flow into the area. The increased flow removes waste products from the cells and delivers nutrients and oxygen, which relax the tissues. Heat also increases flexibility of the soft tissues. Applying the heat and ice technique above are an easy and effective way of speeding up your recovery. We encourage you to consult with one of our friendly physiotherapists as we have fantastic ways of enhancing your injury prevention and recovery. http://www.beachside-physio.com.au/wp-content/uploads/2018/10/Screen-Shot-2018-10-12-at-1.19.40-pm.png 846 1188 Beachside Physio http://www.beachside-physio.com.au/wp-content/uploads/2016/07/Beachside-Logo-web.jpg Beachside Physio2018-10-12 13:22:382018-10-25 10:47:05Ice or Heat?